CALTROPS » Blog Archive » Bang. School started a couple weeks ago for my kids, both of whom have to get up earlier than ever before to catch their respective buses. My 12-year-old son’s bus runs at 6:30am; he gets up at 6. My nine-year-old daughter gets to “sleep in” until 6:45am. This morning when I went into my daughter’s room to wake her up, she rolled over, pointed her finger at me, and said “bang.” A cute, innocent gesture from a child who probably learned it from watching SpongeBob or Bugs Bunny do it. (We watch a lot of retro cartoons in my house.) Had I made this gesture as a child to my parents they would have either laughed or simply “shot” me back. Instead, I had to sit my daughter down and explain to her why she can never make this violent gesture outside our home. Last year, my seven-year-old nephew got suspended from school for three days for bringing a knife to school. He had just joined the Boy Scouts and received his first pocket knife: a tiny “Swiss Army” knock-off complete with a bottle opener, corkscrew, nail file, and a couple of rusty blades no longer than your big toe. He knew he wasn’t supposed to bring it to school but, being seven-years-old and the proud owner of a “new” knife, he did. He showed it to a friend during recess, who told another friend, who told somebody else, who told a teacher. A few minutes later my sister was on her way to the school to pick up this obvious menace to society. I doubt that knife could have penetrated someone’s eyeball without a ten yard running start, but rules are rules, and common sense be damned. Earlier this week, a high school student in South Carolina was both arrested and suspended for writing a story about shooting a dinosaur in creative writing class. In 2013, a five-year-old child in Oklahoma was asked to turn his Michigan sweatshirt inside out because it “promoted gang activity.” Earlier this year, a third grader in Colorado was suspended for shaving her head, which she did to support her friend who has cancer. Earlier this month, a Florida mother had the audacity to let her seven-year-old walk by himself to a neighborhood park. She was arrested and charged with child neglect — a felony. Last month a woman was arrested for leaving her nine-year-old at a park by herself. Last month, a fourth grader from Georgia who was given a school assignment to “bring in some of your favorite toys to talk about” was suspended for bringing a Nerf gun to school. This spring, a high school student was suspended for refusing to turn his NRA t-shirt inside out. The school said that the boy’s shirt “violated the school’s policy prohibiting clothing that might incite or encourage violent activities” by displaying the Second Amendment. In 2000, police were called after a fourth grader threatened to shoot a paper wad at another student using a rubber band. 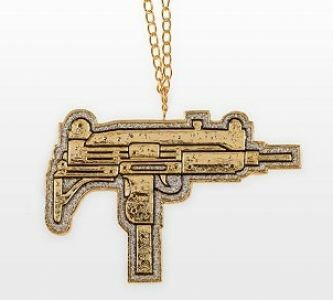 In 2008, a third grade student was suspended and set home after bringing a 1 1/2 inch charm/medallion shaped like a gun to school. “Rumors of the incident also scared two families into keeping their children home the next day,” according to the story. The story that came to mind though was this one. In 2013, a third grader was suspended for “using his thumb and index finger to pretend his hand was a gun,” exactly what my daughter did to me. I had to sit down with my nine-year-old daughter and explain to her that pointing her finger at someone and pretending it was a gun — even if her finger wasn’t loaded — could get her suspended from school. What I didn’t tell her about were all the times my friends and I played cops and robbers. We played “war” a lot as a kid. A few of us had camouflage pants and hand-me-down Army jackets that we would wear while running around the neighborhood chasing one another and yelling “bang!” Then there were the Roman Candle wars, in which we lit fireworks and shot them at one another. God forbid the stories of our BB gun wars ever get out; I don’t know that 30 years exceeds the statute of limitations for that. One year for Halloween I dressed up as a ninja, and carried with me a real ninja sword. While the blade was made of aluminum alloy and therefor unable to be sharpened, I’m sure that would not dissuade a police officer or well-meaning citizen for shooting you for brandishing it. Had someone tried to take it from me I would have thrown one of the throwing stars in my pocket at them. Not one of those dumb foam ones; real metal ones, the ones that stuck in wood and sheet rock and people’s faces. For the record, I never stuck a shuriken into anyone’s face. I played Dungeons and Dragons and never worshiped the devil. I listened to heavy metal and never tried drugs. I played with toys with little parts and never choked. I drank drinks with aspartame and never got cancer. I watched violent movies and played violent video games and never once tried to kill anyone. And I pointed my finger at other kids, said “bang,” and never once shot another human being. Just for the record — so far we have suspended and/or arrested children for wearing t-shirts with college logos, bringing Nerf guns and gun-shaped medallions (the size of a Monopoly piece) to school, shaving their heads to support friends with cancer, threatening to shoot another student with a rubber band, and for writing about threatening to shoot a neighbor’s pet dinosaur as part of a creative writing assignment. 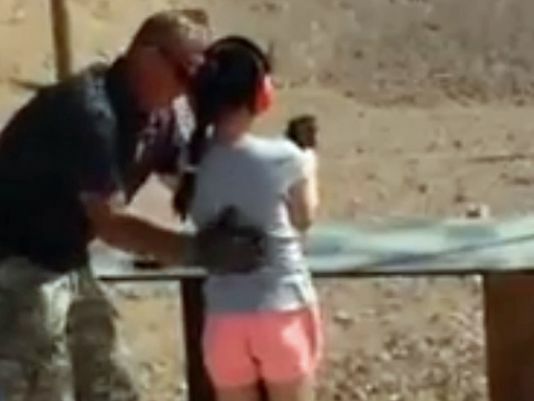 Earlier this week, a gun range instructor was killed after handing a fully automatic Uzi submachine to a nine-year-old girl (the same age as my daughter) at a gun range as her parents recorded the incident with their cell phone. It is not currently known whether or not the girl had ever worn Michigan sweatshirts to school, shaved her head, or ever walked to a park alone before. Neither the girl’s parents nor the gun range, all of whom thought it would be a good idea to place a fully automatic machine gun in the hands of a nine-year-old girl, have been charged with any crimes. Our kids are not the problem here.